Advanced Semiconductor Engineering —which handles packaging and testing RF, Wi-Fi, and MEMS chips for iPhones and Apple Watches —is expected to set a new record when it announces results for the December quarter, DigiTimes sources said. In November, ASE affiliate Universal Scientific Industrial saw monthly revenues jump 23.89 percent year-over-year to $482.81 million, allegedly because of system-in-package (SiP) orders for the Series 3. Even though Apple has regularly claimed the Watch as a success, it has so far declined to share exact figures. The company could be worried about disappointing analysts and investors —but successful or not, the Watch still generates far less money than iPhones, iPads, and Macs, which is likely why it's buried within an "other products" reporting segment alongside Beats and the Apple TV. In the September quarter that combined segment generated $3.231 billion in revenue, below even the $4.831 billion from the iPad. ShunSin, a packaging and testing firm under Apple assembly partner Foxconn, is said to be bidding for system-in-package orders for 2018 Watch models. The DigiTimes sources predicted that Apple is unlikely to seriously consider changing up orders until 2019, when it may want to diversify SiP packaging and testing partners to accommodate demand. 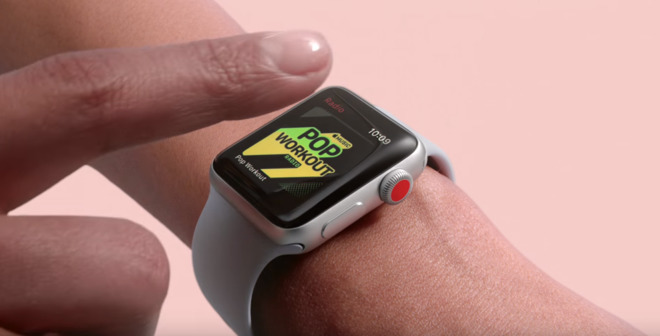 The Series 3 is the first Watch to offer models with LTE, making it possible to use some —though not all —functions without a paired iPhone nearby.